Is breakdancing an Olympic sport? Well organisers of the 2024 games in Paris think it should be. So they've asked the people in charge of the rules surrounding the Olympic games - the International Olympic Committee (IOC) - to consider breakdancing, as well as surfing, climbing and skateboarding, to be featured in the 2024 games. Breakdancing was included in the Youth Olympic Games in Buenos Aires in 2018 so it's not completely unheard of. The IOC will consider the proposal and must decide by December 2020. The Youth Olympics saw breakdancers go head-to-head in "battles" a set up that may be used in Paris. 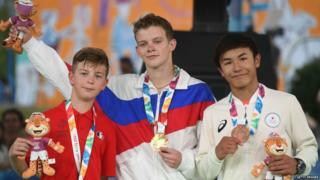 Russia's Sergei (Bumblebee) Chernyshev , won the first breakdancing gold medal for boys at last year's Youth Olympics, while Japan's Ramu Kawai won the girls' title.